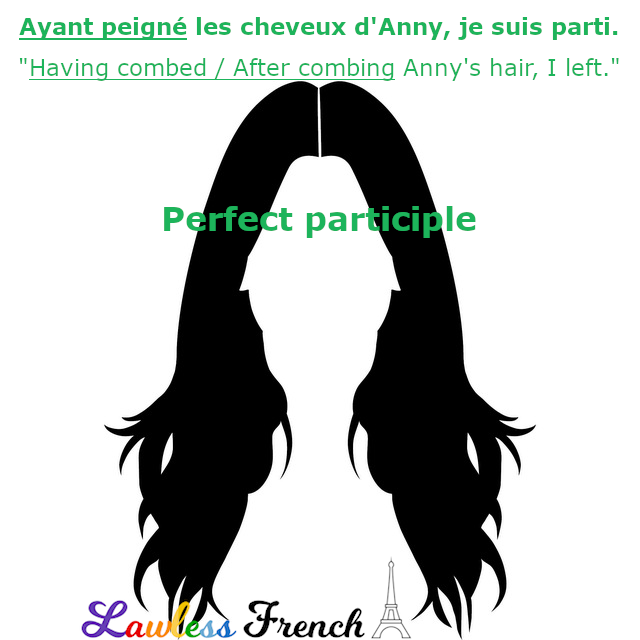 Since the auxiliary verb is in the present participle, the conjugation for avoir verbs is the same for all subject pronouns. Ayant donné du sang, je suis parti. Having given blood, I left. > After giving blood, I left. Ayant donné du sang, nous sommes partis. Having given blood, we left. > After giving blood, we left. However, in the case of être and pronominal verbs, agreement of the past participle is required, and the reflexive pronoun must agree with the implied subject. Étant tombée, elle a commencé à pleuvoir. Having fallen, she started to cry. > After falling, she started to cry. Nous étant levés à midi, nous étions en retard. Having gotten up at noon, we were late. As in all compound conjugations, the past participle in the perfect participle construction may need to agree in gender and number with the word it modifies – learn more.